Nancy was robbed at GUN POINT in LODON. Nancy was robbed at GUN POINT in LODON! We received an interesting letter today. Actually, we had heard a radio talk-show host describe the letter several weeks ago and admit to “almost” sending $1000 dollars to the sender. (So much for the intelligence of talk radio hosts.) Forewarned that it was a scam, we had a copy boy take the letter to the desk of Luke Warm. An hour later the copy boy returned with the reply. I'm so sorry for not informing you about my traveling,my family and I come down here in LODON,United kingdom for a short vacation unfortunately we got robbed at the park of the hotel where we stayed,worse of it all the necessary things have been stolen, bags, cash , credit cards and cell phone as been stolen off at GUN POINT, it's such a crazy experience for us. We need help to get back home and the authorities are not being 100% supportive but the good thing is that we still have our passports but we don't have enough money to get our flight tickets back home and pay for the hotel bills and the hotel manager won't let us leave.I'm just gonna have to plead with you to lend me some funds right now to sort out the bills,I promise to refund it back as soon as I get home. Hanging in here to read from you. Your letter came as such a surprise. Partly because I don’t know anyone named Nancy. Since no one in America has been named Nancy since 1956, you’re getting a little long-in-the-tooth to be getting into these sorts of jams, wouldn’t you agree? BTW, Did you ever marry Sluggo? I’ve always felt that cartoonists have given short shrift to syndicated romances. (I’d also like to say your Aunt Fritzi was a real babe.) 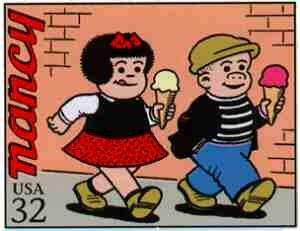 I’d love to ask if Sluggo was the name on his birth certificate – or if he was, indeed, even born in the U.S. But you might not be that Nancy. In the future, please don’t feel guilty about not letting me know about your vacation plans. As much as I’d like, I really can’t keep with where my friends go. Most of us “here” go “over” to London and “down” to Mexico. Up to Canada – etc. You’re not the Nancy I met in Lapland, are you? I’m sorry to be picking your plea apart, but it’s just too much fun. Yes, I agree getting robbed at GUN POINT is “a crazy experience” as you put it. Even getting robbed at lower case gunpoint can leave a psychological mark. At the park of the hotel?! I believe that’s called a lobby. Was there grass? Well, there you have it – parks have grass. Those ficus trees are just for show. Was the GUN MAN wearing a tilted round Scottish military cap with a double row of brass buttons on his tunic? Gee, Nancy! That’s just the bellhop. Report him at once. You aren’t the Nancy from Biloxi are you? Please don’t get your feelings hurt, but one thing that makes me doubt your story is your admitting to not purchasing a round-trip ticket. The few Nancys (or is it Nancies?) I have known have all been practical types. Oh, My! I mistook LODON for London. My mistake. After Googling Lodon, I found that it is indeed a notorious den of GUN POINT thieves, hotels do indeed have parks there and “authorities” are indeed notorious for not being 100% supportive. My apologies. Why on earth, would you want to go there, Nancy? Especially one way? Hotel managers that won’t allow guests to leave faded out in the 1930s – at least here. Maybe Lodon is behind the times. If you are playing by 19th century rules, there’s your solution! Back then there were always chores to do to pay for your room. Laundering the pomade from the antimacassars for instance or cleaning spittoons. Airing the horsehair from the lobby sofas – I’ll bet that hasn’t been done in ages! When you get back you’ll have to tell us all about it. The sad truth is, Nancy, I’m broke after sending my bank account number to an “American soljer” who needed to “smugle $10 Bilion US-type dolars” out of Iraq. As soon as I hear from him (the check is slightly overdue), I’ll forward some money to you. Is cash okay or do you want a bank transfer? Perhaps on future vacations you might want to consider sunny Nigeria. This is all to “read” from me at the moment. Texas | TE Online Magazine | Columns | "15 Minutes of Separation"